Standing proudly in front of its own section of beach, the Sunrise Hotel certainly boasts an excellent location. Inside, you'll find great perks like a Turkish bath and sauna, a gym, a buffet restaurant and bright rooms, some with sea views. Outside, there's a swimming pool and a furnished sun terrace with views out to see. Pad down to the beach and youll find more sun loungers lined up along the shoreline. 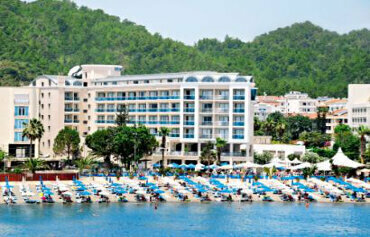 With its prime spot and superb facilities, its easy to see why this 4 star Marmaris hotel is an award winner. All the rooms at this 4 star Marmaris hotel have TV, telephone, hairdryer and a minibar. Most rooms have a bath, although some have showers only. Several rooms have a limited or partially obscured sea view. Rooms have centrally controlled air conditioning from the beginning of June to the end of September, depending on the weather. 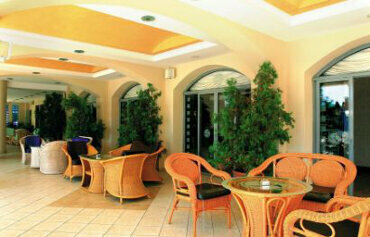 The Sunrise has its own onsite restaurant, which offers both buffet and a la carte options. There is also a British style pub with large TV and a pool / beach bar. Occasional evening entertainment is offered in the form of live music. 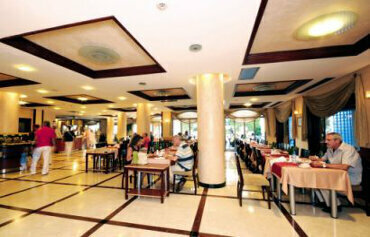 This seafront Marmaris hotel is located right by the beach, 3km from the main bazaar and Marina. There are shops, bars and restaurants within the hotels vicinity.